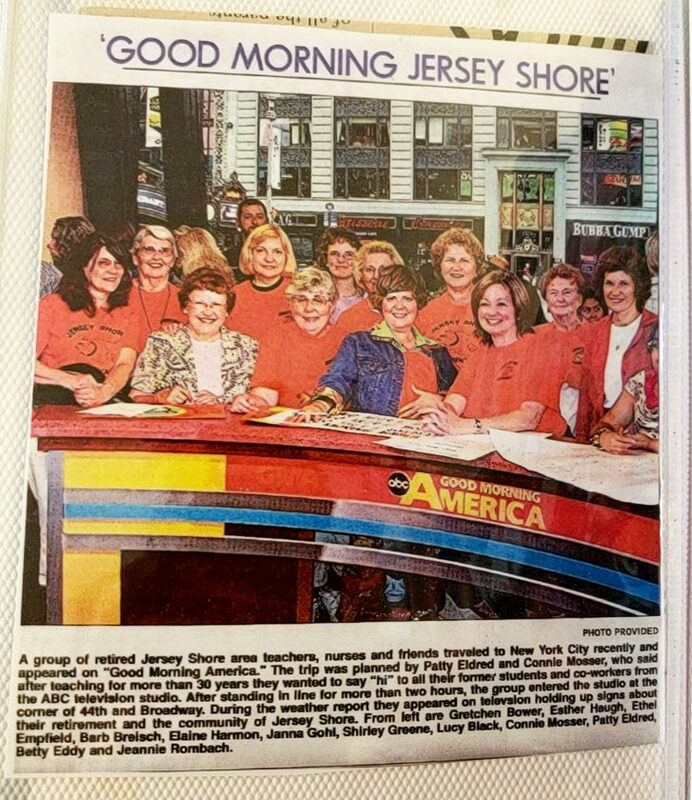 PHOTO PROVIDED Good Morning Jersey Shore In 2006, a group of retired teachers, nurses, and friends traveled to New York City to be on Good Morning America. The trip was planned by Patty Eldred and Connie Moser who said, after teaching for more than 30 years, they want to say “hi” to all their former students and coworkers from the ABC television studio. The group stood in line for over two hours before getting a chance to enter the studio. Pictured at the news desk are, from left, Gretchen Bower, Esther Haugh, Ethel Empfield, Barb Breisch, Elaine Harmon, Jana Gohl, Shirley Greene, Lucy Black, Connie Mosser, Patty Eldred, Betty Eddy and Jeannie Rombach. Thank you Lucy Black for sharing this moment with our readers! In 2006, a group of retired teachers, nurses, and friends traveled to New York City to be on Good Morning America. The trip was planned by Patty Eldred and Connie Moser who said, after teaching for more than 30 years, they want to say “hi” to all their former students and coworkers from the ABC television studio. The group stood in line for over two hours before getting a chance to enter the studio. Pictured at the news desk are, from left, Gretchen Bower, Esther Haugh, Ethel Empfield, Barb Breisch, Elaine Harmon, Jana Gohl, Shirley Greene, Lucy Black, Connie Mosser, Patty Eldred, Betty Eddy and Jeannie Rombach. Thank you Lucy Black for sharing this moment with our readers!